One day I’ll hand my daughter her first weapon. A massive, 3,700-pound, hulking piece of lacquered steel. A gas-slurping, road-hogging, hydraulic-steering automobile. After many practice runs she’ll sit alone behind the wheel, and I’ll sit alone at home, praying for her safe return. “The first 30 to 90 days of independent driving are the deadliest,” says Pam Fischer, former director of the New Jersey Division of Highway Traffic Safety and leader of the New Jersey Teen Safe Driving Coalition. For most parents, a car for their children means both freedom and fear. We can’t wait for them to drive themselves to hockey and swim practice. They can’t wait to make a clean break, severing that figurative umbilical cord with the turn of a key. That downward trend is partly the result of graduated driving licensing laws that states began implementing in the mid-1990s. Driving privileges are granted through a three-tier program: learner’s, intermediate and full licensing. Requirements vary widely from state to state—one can get a learner’s (or restricted) permit as young as 14 or as old as 16. Six states start at 14. Most states mandate that a learner complete a certain number of supervised driving hours, usually with a parent or guardian. South Dakota and Arkansas do not require supervised hours, while Massachusetts demands 30 to 40 hours of supervised driving, on top of a mandatory 12 hours of behind-the-wheel classes with a licensed professional. Most states impose curfews for intermediate license holders, because studies have shown that almost half of fatal teen crashes occur at night. All but three states restrict the number of teen passengers that an intermediate driver can tote along. 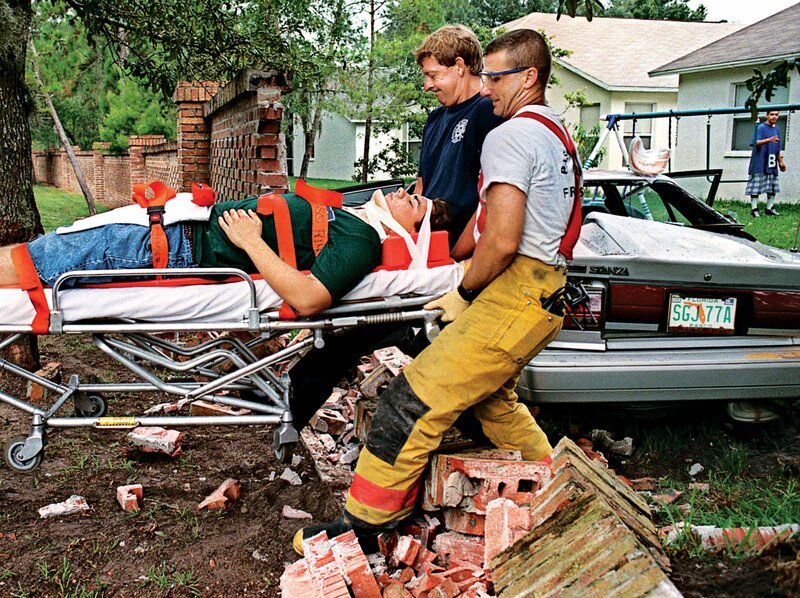 When two or more teen passengers are in the vehicle, the crash risk is three times as high. New Jersey is the only state where learner’s and intermediate licensees must display a reflective decal, a practice Britain and Spain have used for years to help law enforcement identify novice drivers. After the first two years of its decal implementation, New Jersey’s teen crash rate went down almost 10 percent. Every year his organization enlists professional drivers to train—free of charge—almost 5,000 teens and their parents in cars donated by Kia. Drivingskillsforlife.com, created in 2003, offers a virtual learning academy with 14 video modules and hosts live programs with its own roster of professionals—from Hollywood stunt drivers to Indy 500 racers—in cities across the U.S. Almost every other weekend has 400 teens signing up for the free, hands-on driving clinics. “We go beyond basic driver’s ed,” says Jim Graham, the program’s general manager. “We focus on skills like vehicle handling, hazard recognition and distracted driving.” Driveithome.org and teendriversource.org are other sites that help adults become better driving coaches. Still, most families do pay for some instruction. In New Jersey, the average cost of six hours of required classes is $300. “I would love to see our culture and country adopt the mindset that this is an investment in a life skill, “ says Fischer. DrivingMBA, an Arizona school with two campuses, charges $800 for its 19-hour basic course. It includes a parent class, classroom study, hands-on instruction and time spent in an elaborate simulator. “Letting teens experience car crashes through a simulator is a powerful tool,” says DrivingMBA partner Charles Sobczak. New technology, like simulators once reserved for flight training, has boosted road safety. MyKey is one innovative system that comes standard on most Ford vehicles. Its many features include letting parents set a top speed or keeping the radio on mute until seat belts are clicked. In a 2011 study, the Children’s Hospital of Philadelphia found that 50 percent of teens killed in teen driver accidents had not buckled up. “It boggles the mind that teens—who grew up in car seats—forget to buckle up,” says Fischer. Other safety systems on the cusp of becoming mainstream include a steering wheel that vibrates when you drift out of your lane and radar detectors to alert you if a car is in your blind spot. Whatever combination of private, public, parent- or tech-centered instruction you choose, Fischer offers up some important tips. “Driving habits start the minute you bring your baby home from the hospital. If you have a lead foot, are an aggressive driver or text and drive, guess what message you’re sending?” When it comes to buying a child’s first car, she says older is not always wiser. “You want a vehicle with key safety features, air bags and electronic-stability control at a minimum.” AAA.org and IIHS.org are two sites that rank the safest cars for teens. Yes, it takes a village to learn how to steer. But since the first Model T rolled off the assembly line, owning a car has become a rite of passage. They’re humanized in movies, raced in sporting events and glamorized in Super Bowl commercials. Our love affair with them shows no signs of slowing down—so long as our kids can safely come to a complete stop.